"You don't have to be in a "Three Hat" restaurant to impress your guests"
Sydney Harbour never fails to impress at all times of day. Our catering options have been tailored to suit alfresco dining on board a yacht. EVERYONE remembers the sailing when they step off the boat, however it doesn't have to be as extreme as America's Cup racing! 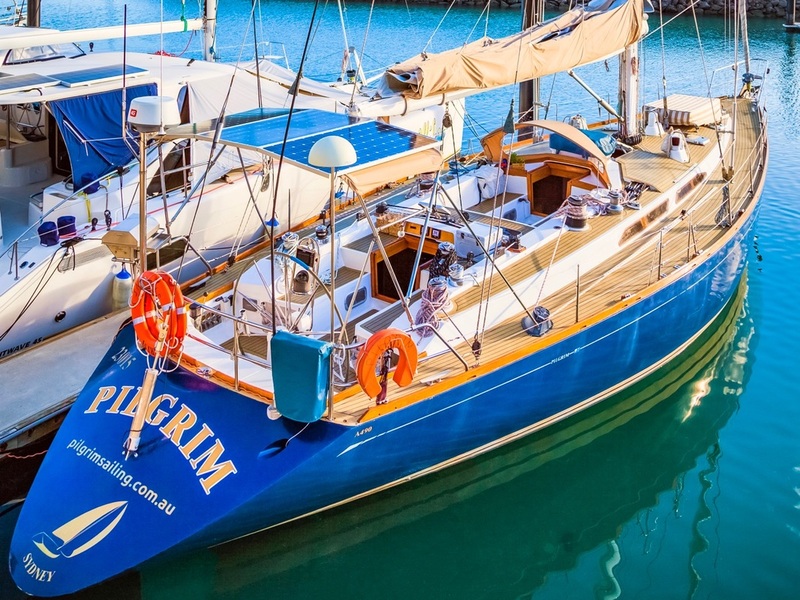 Pilgrim is 17 metres of class with an incredible story behind her. 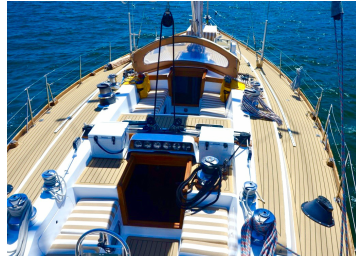 She's a classic style yacht, custom built & maintained to the highest of standards. She's set up perfectly for entertaining with three separate areas on deck - two cockpits and the foredeck. Our wine selection is from Tamburlaine Organic Wines, a boutique winery in the Hunter Valley. ​However if you're looking for a extra special bottle of something please let us know and we will be able to tailor a wine list just for you. Pilgrim is licensed for up to 24 guests. ​For larger groups we can arrange multiple boats. Over the years we've learnt what suits one group may not suit another and we're quick to assess what you're trying to achieve from your day. We'll have a conversation well before the event to ensure that the day we have planned is exactly what you after - from the drinks and the catering right down to the type of sailing you want to do, the level of formality of the event etc. We will adapt the schedule on the day to suit the guests if we need to. Just because we're on a sailing boat doesn't mean that we are restricted in the standard of catering. Pilgrim's galley has produced some spectacular meals over the years. ​Our speciality for corporate entertaining packages is the seafood banquet - fresh seafood from the Sydney Fish Market & delicious accompaniments. However we also have a range of other options available or we can construct a menu to suit your tastes. Need a space to hold a meeting before you head out sailing for the afternoon or a place to go back to right on the water with beautiful harbour views for drinks and canapés. Let us know and we can arrange the full package for you. Four hours sail & lunch on a beautiful sailing yacht on Sydney Harbour. Once on board guests will be served a glass of Champagne or a choice or wine or beer. 11.00-12.00pm | Pull up sails & go for a sail! We'll always sail under the Harbour Bridge & past the Sydney Opera House and other Sydney harbour highlights. If guests are looking for more adventure, we can sail through Sydney Heads and experience the open ocean! The sailing itinerary will be determined on the day based on wind conditions and guests desires. During the sail, guests drinks will be topped up and accompanied by Sydney Rock Oysters, Prawns or Canapé platters. We often anchor in Athol Bay with its breathtaking views of the Sydney Harbour Bridge & Sydney Opera House. If the wind conditions don't suit this anchorage there are plenty of equally stunning backdrops around the harbour for lunch. Herb Crusted Sirloin or Poached Ocean Trout will served accompanied by salads and Sonoma Sourdough bread and a selection of Tamburlaine Organic Wines. Guests will enjoy a gentle motor or sail back to King Street Wharf while a light dessert is served. All times, locations and menus are an example and can be tailored to suit the guests. Team meeting followed by team building on Sydney Harbour followed by a debrief and drinks & canapés at Sydney Seaplanes Terminal overlooking Sydney Harbour. Hold team meeting in Sydney Seaplanes private room. Refreshments available. ​Pilgrim will pull alongside the public wharf at Rose Bay (2 minutes walk) from the Sydney Seaplanes Terminal. 11.30-1.00pm | Pull up sails & go for a sail! The sailing itinerary will be determined on the day based on wind conditions and the objectives of the team. It will always commence with a safety briefing and basic sailing lesson followed by the practical hands on session. Team will return to Sydney Seaplanes Terminal for a debrief and some drinks and canapés in their private room overlooking Sydney Harbour. All times, locations and menus are an example and can be tailored to suit the team. Two hour sailing cruise on a beautiful sailing yacht on Sydney Harbour. The route is determined on the day based on guests wishes and wind conditions. It will always include a sail by the Sydney Opera House, a sail under the Harbour Bridge. 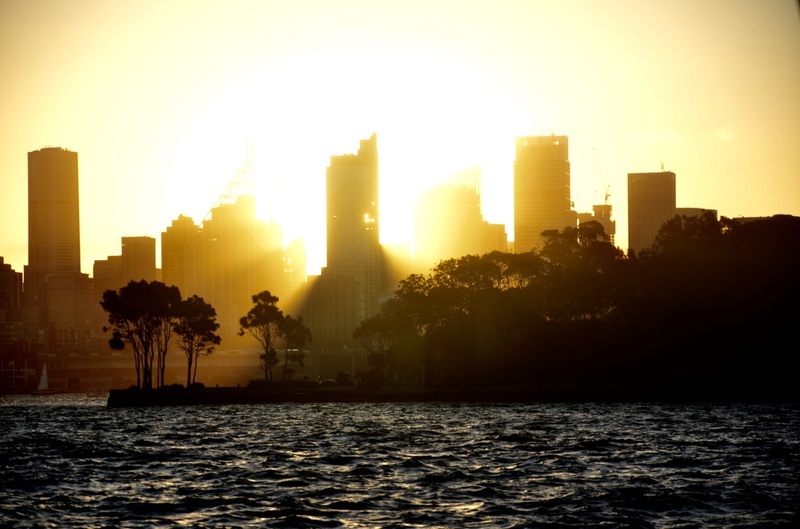 ​For the sunset cruises we sail for the full two hours so cover plenty of Sydney Harbour.